This superb folded origami art piece is made with a 12″ square of super-thin Deep Ocean O-Gami (brand) paper. Created, folded and donated by the artist for the Origami Caravan auction. This is a rare, out-of-print book donated for the Origami Caravan auction by Ramsay “RC” Cowlishaw. Original publication date: 1983; this copy is from 1986. 10.5″ x 7.5″, 168 pages. Excellent condition. DAO Cuong Quyet, Jucumaris Bear. This charming folded origami art piece is made with a dragon scale patterned wrapping paper. Created, folded and donated by the artist for the Origami Caravan auction. NGUYEN Tu Tuan, Mother and Child. An elegant, abstract origami sculpture wet-folded from one sheet of white Canson paper. 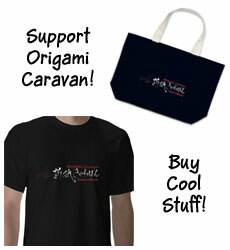 Created for and donated by the artist for the Origami Caravan auction. Deer by Seiji NISHIKAWA live for bidding! An elegantly folded origami sculpture folded from a single sheet of handmade Origami-do paper, no cuts. Created for and donated to the Origami Caravan auction by the artist.